Posted in Connections through Culture, General and tagged A Disappearing Number, award winning British play, british council india arts, Complicité's A Disappearing Number, G. H. Hardy, Prithvi Theatre, Simon McBurney, Srinavasa Ramanujan, Tata Photon on July 16, 2010 by British Council India. 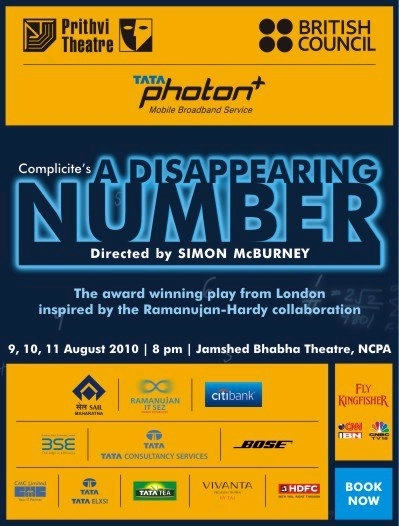 The British Council, Prithvi Theatre and Tata Photon present renowned British experimental theatre Complicité’s A Disappearing Number, an award winning British play inspired by the legendary mathematical collaboration of Srinavasa Ramanujan and G. H. Hardy. Tickets sale begins Friday, 16 July 2010 for NCPA members and Sunday, 18 July 2010 for public. Senior Citizen & Student discounts on certain tickets (ID must be shown).